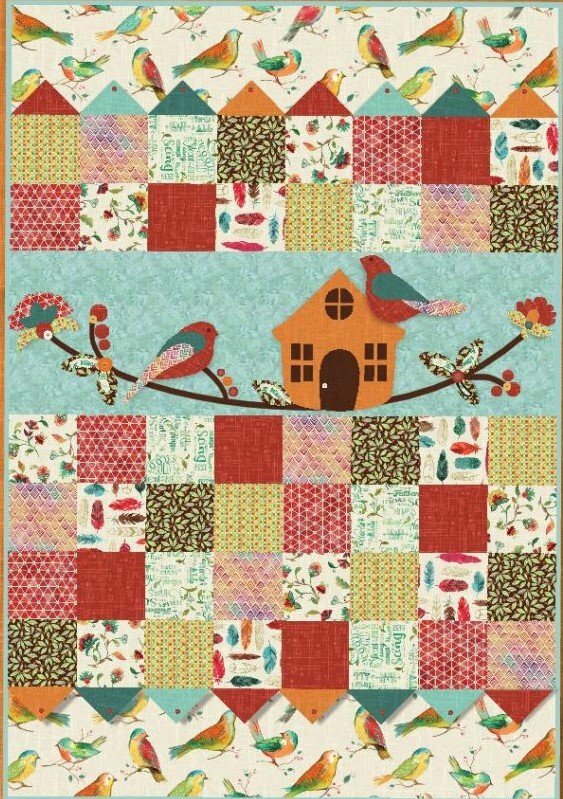 The two patterns featured in this pattern duo are the wall hanging, All A Twitter and Woodland Song, place mats and mug rugs. Both are Fat Quarter friendly and feature the fabric line All A Twitter from Hoffman Fabrics. All a Twitter Quilt Dimensions: 40.5” X 58.5” - People will be talking about this charming quilt with its easy piecing and unique applique. Delightful prairie-points add dimension and whimsy. For the intermediate quilter. Woodland Song Place mats and Mug Rugs Dimensions: 13” x 18” and 5” x 6 ¾” - Adorn your table with a set of these delightful place mats. Surround your focal fabric with fun accents, including buttons and pinwheels. Make the accompanying mug rugs with any leftover fabric.